Brette Holland has a passion for learning, sports and fitness. A Mechanical Engineering student on the Dalhousie Agricultural Campus, Brette was named Rookie of the Year for Golf in 2014-15 and MVP for 2015-16. She was named a CCAA Academic All-Canadian, ACAA All Conference and Dal AC All Academic Athlete for 2014-15. She is also an avid runner, having participated in many local races and competing in the Nike Women’s half marathon in Washington, DC in 2014. “As a student athlete at the AC, playing on both the women’s varsity soccer and golf teams, I had many great experiences,” said Brette. “As a member of the 2015 women’s golf team, playing in the national championships in BC will be a memory I will always treasure,” she added. Brette was most recently awarded the Nova Scotia Power Centennial Scholarship for 2016. This scholarship is awarded annually to students commencing full-time studies at Dalhousie University’s Faculty of Engineering and is renewable for two years. 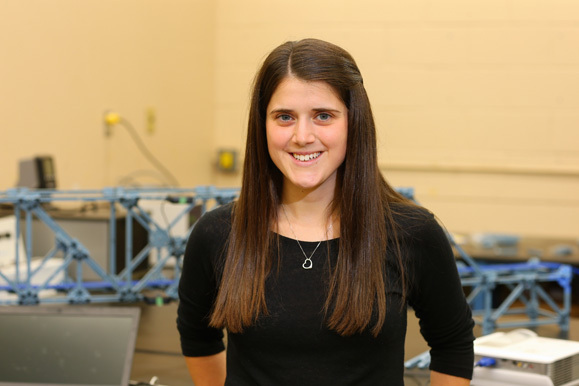 Brette graduated from Dalhousie University with distinction in 2013 with a Bachelor of Science with a Major in Mathematics and a Certificate in Actuarial and Financial Mathematics. She has been named to the Dean’s List every year of her university studies, both during her first degree and her current Engineering Diploma. In her spare time, Brette is also a certified Zumba and ZumbAtomic instructor, having taught regular classes in Halifax, Enfield and Brookfield, NS. She has volunteered her Zumba skills for a multitude of fundraising events, including Relay for Life, Alzheimer’s Society of Nova Scotia and Girl Guides. She also tutors math at all grade levels. Brette completed her two-year Mechanical Enginnering Diploma on the Ag Campus and will compete her degree on Dalhousie University’s Halifax campus in September as a third year Mechanical Engineering student in the co-op program. Brette did her first two years of Engineering at the Faculty of Agriculture, earning her diploma, then she will go on to complete her degree on Dalhousie's Halifax campus. Visit our Department of Engineering.